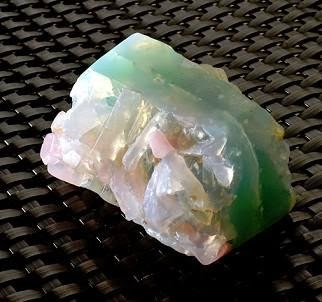 A Mermaid's Gift to the Sailor. January brings another first for me. Oil inventory and using up those obscure oils purchased for other projects and not consumed. In the first month of the year clearing out the old and making room for the new! We all have bits and pieces of unused exotic ingredients that have a definite shelf life. Each January my new habit will be to sort those infrequently used oils those close to expiration and use them with in the month! So January will by my recycle month and my soaps will be designed around the exotic oils "WHY did I buy this Emu Oil" purchase that lives in the refrigerator! A Mermaids Gift to the Sailor, a tribute to the up coming Saint Valentine Day Celebration. 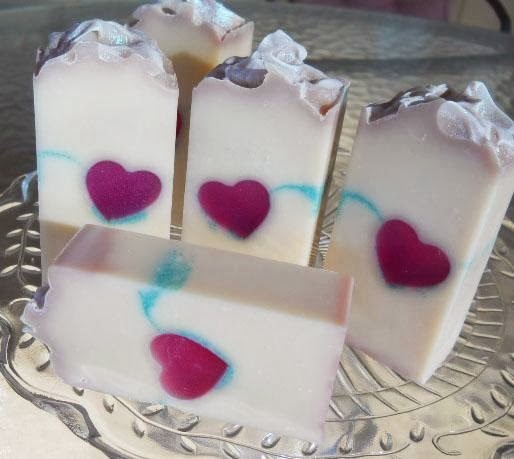 Designed to be a floating heart made of translucent soap heart floating in an aqua pool. It is fragranced with a male fragrance. I've used 7 oils and butters. 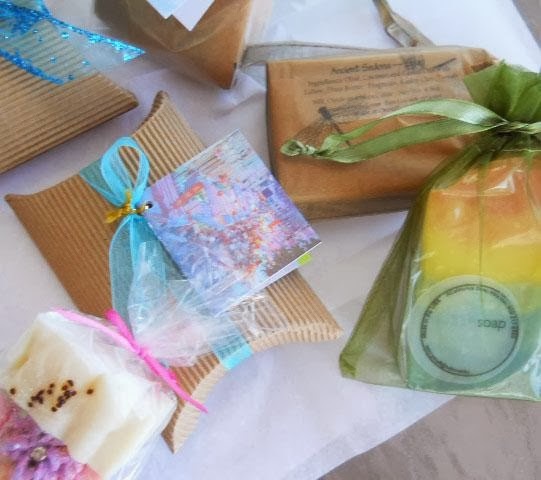 It contains the usual suspects olive, coconut and Castor oils and includes the exotic's from Babassu and Meadow foam to Avocado Oil and Mango Seed Butter. I am so happy with how this formula preforms! 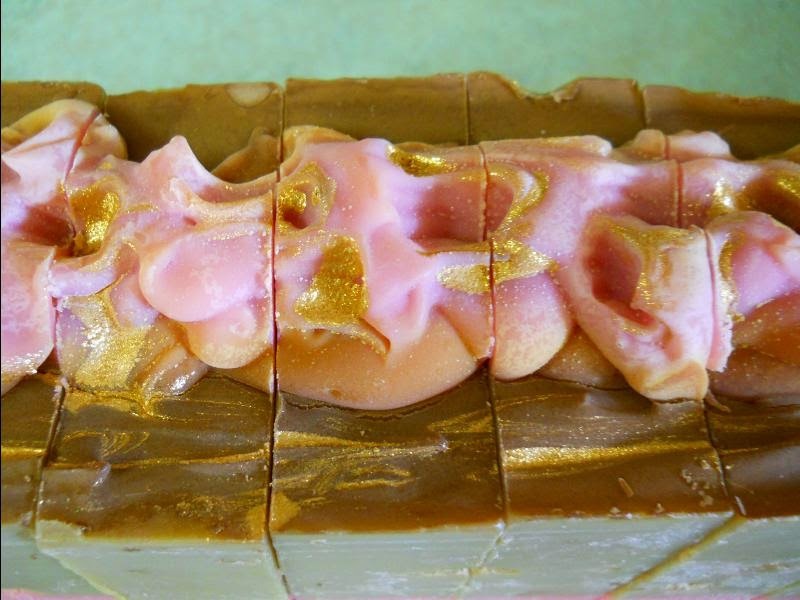 The velvet lather and smallish bubbles of this gentle soap are spectacular. Coconut 12% - Avocado 7% - Palm 20% - Mango Seed 10% - Babassu Oil 10% - Castor Oil 7% - MeadowFoam 4% Super Fatted at 8%. A complex male fragrance that includes citrus, peppercorn, jasmine and labdanum. Oh yum a male perfumery, a sophisticated aftershave fragrance that I'm sure Daniel Craig would love! This fragrance does discolor to a beige/pink like many male fragrances do. The silicone heart mold for the embed is a new one from Bramble Berry and so fun to use. Mermaids are the legendary aquatic creatures with the upper body of a female human and the tail of fish. Maids of the sea! 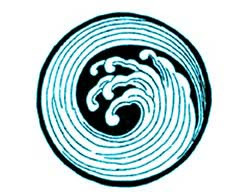 Popular worldwide their first stories appeared in ancient Greek Mythology as sirens. The Manatee or so called gentle sea cow is thought to be the inspiration of mermaid myths. Mermaids have been a popular subject of art and literature thru the ages. The Little Mermaid (1836) by Hans Christian Andersen is such a well-known fairy tale perpetuating the popularity of the mythical creatures. Mysterious and illusive all at the same time, they have been depicted in operas, paintings, books and films. Mermaids those beautiful mythical beings of a sailors heart and a little girls dreams. Happy New Year Everyone 2014! Castile a first for 2014 along with two other firsts for ACaliforniaSaop, bytheseasoap.com! My first Castile soap and the first soap of 2014. Made with 100% Lucero Mandarin Infused Olive Oil! 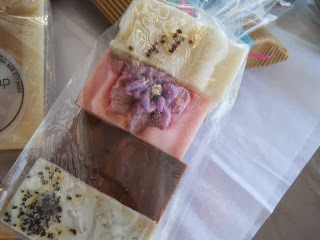 I will post individual photos when I cut the soap in two or three weeks. It will need to sit on the curing rack for 1 year that is the nature of this gentle Castile soap! Inspired by Lucero Olive Oils a local orchard which supplied the oil for this soap can be found here. Another first for this year was using a new silicone mold liner for a 9 bar wooden mold I have on hand. 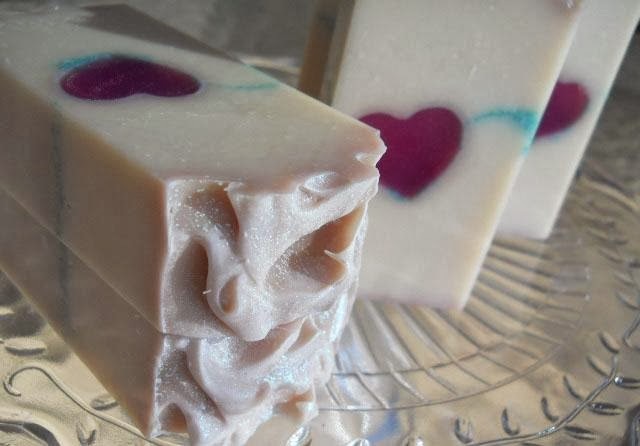 The liner proved to be perfect for this slab soap and made such a smooth sided soap. So easy to use and clean and so professional I just had to order a few more! I thought I'd share with you that I got this liner from the famous BrambleBerry right here. 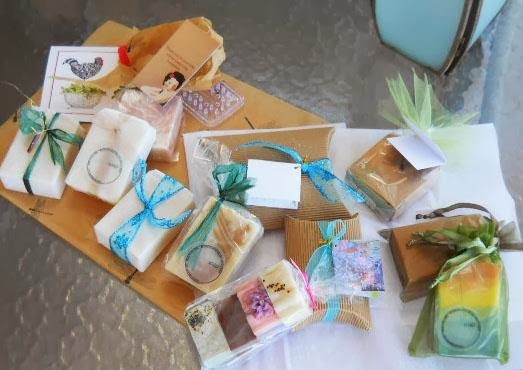 Some one wonderful person from so far away liked my soapy creations and made my year! I can't THANK you enough <3! 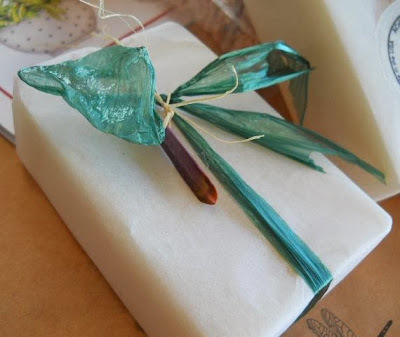 A sample soap package made for the Christmas season. 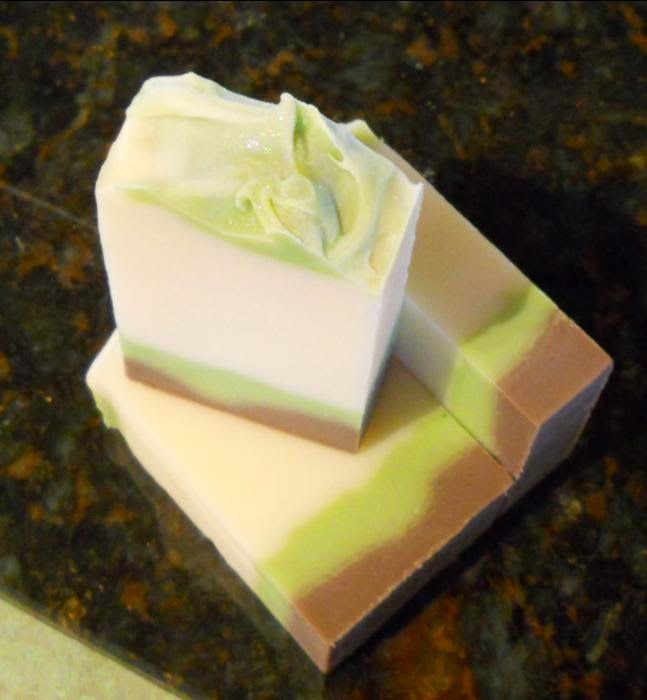 White Citrus, Lahaina, Pink Sugar and Green Tea. Off they all went to the far beyond over the pond and across the sea! Happy New Year 2014 everyone! I hope your year is full of fun, family, friends, love and peace. May good health guard your door step and enough money fill your pockets to share with those who haven't enough. Here is a year in review from my FB page. Some of the highlights from 2013. My new favorite fragrance is Hydrangea. I know I know they don't have a fragrance but by all accounts this is a lovely white floral fragranced soap and very popular so far! 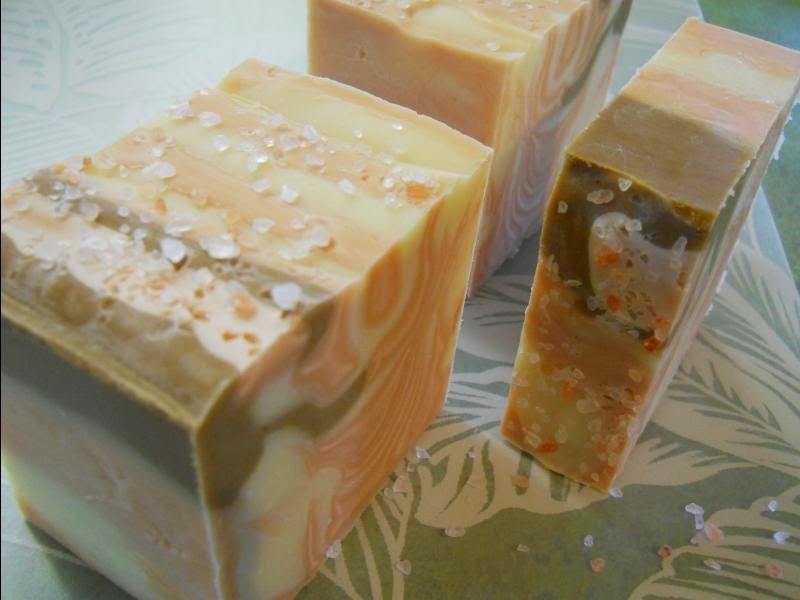 This soap photo is for a challenge and was suppose to be tiger stripes! 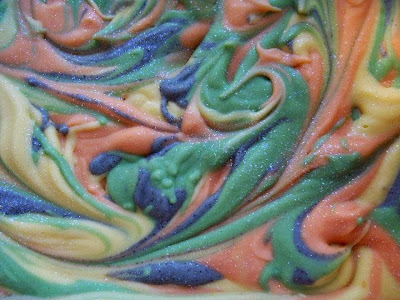 Well here we have Salt Water Taffy soap cocoa butter and vanilla citrus fragrance. 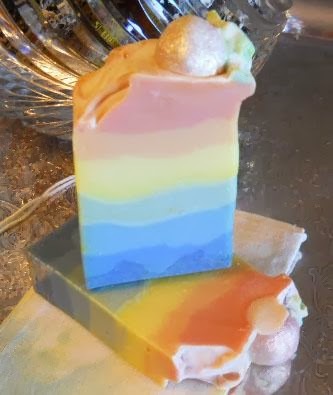 It was a challenge and I learned how to do one fragrance in part of the soap and a second fragrance to color another bit. Happy Easter everyone! 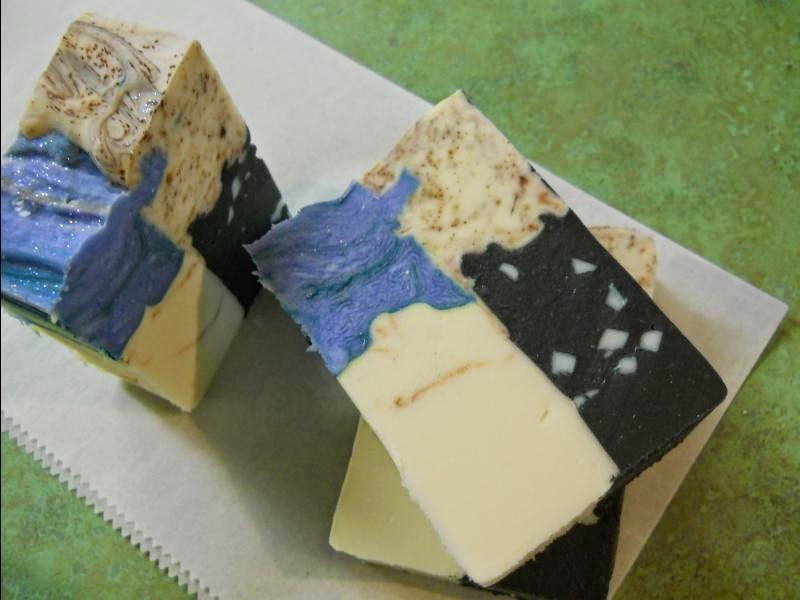 This Sand&Sea Moon and Stars soap was also an experiment for a challenge. 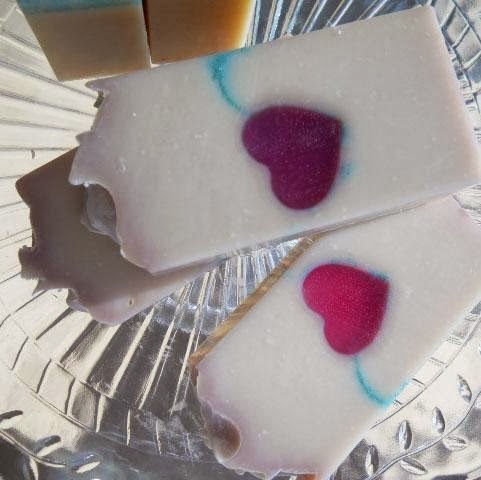 Another creamy lovely soap fragranced each section in a different fragrance and what fun that was! Seeing spots? 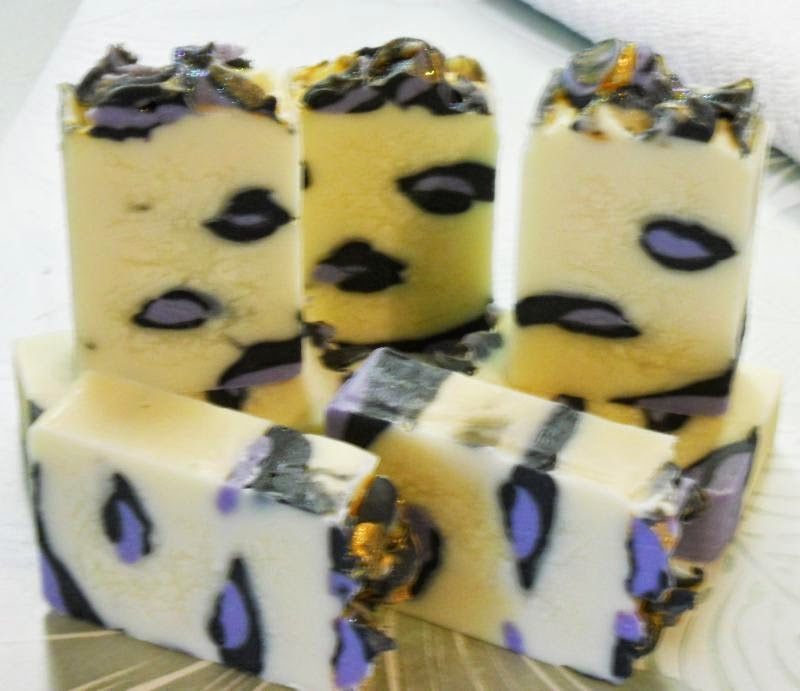 Yes leaping leopard spots on Lilac soap. More soaping luxury bars, non drying luscious bubbles and lather and I smell so good! 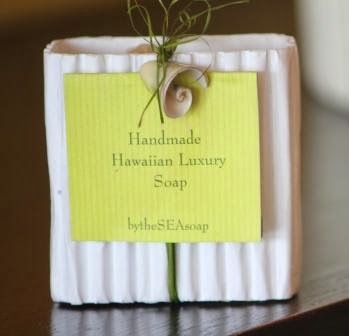 LOL Kiko soaps if you're in Hawi, Hawaii! 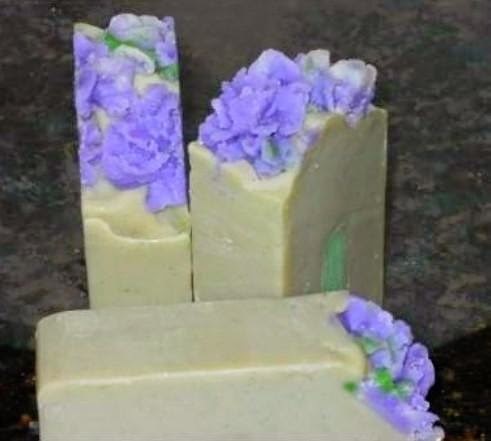 Although Lilac doesn't grow in Hawaii to my knowledge it smells wonderful in this soapy!